The average American eats three pounds of peanut butter a year ― that’s a whole lot of peanut butter and jelly sandwiches. Most of those peanut butter consumers know that the beloved spread is made from ground peanuts, but do you know how those peanuts grow? Have you ever even thought about it? Peanuts, unlike almonds and walnuts, do not grow on trees. They’re actually not nuts at all, but legumes like peas and lentils ― and they grow in the ground. A peanut crop growing in the fields of Loxley, Alabama. The peanut plant is a short plant, growing up to 18 inches tall. It’s an unusual plant because it flowers above ground, but fruits below ground. When it gets to be about a foot tall, long pointed pegs ― called peduncles ― grow from the plant’s faded flowers into the ground. It is these pegs that grow peanuts, not the plant’s roots. An illustration of how the peanut plant grows peanuts. Peanuts are ready to harvest when the leaves of the plant turn yellow and the peanuts’ inner shells have gold-marked veins. After that point, the pegs can become brittle and break in the ground, making harvesting much harder. Harvest is done by pulling the plants out of the ground and allowing them to dry in a warm, dry spot until the leaves become crumbly. Peanut plants pulled in the field. 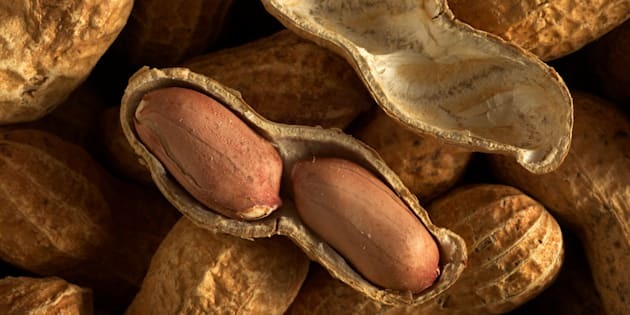 The average peanut plant will yield somewhere between 25 to 50 peanuts and it takes about 850 peanuts to make an 18-ounce jar of peanut butter. It’s something to think about next time you scoop a spoon of peanut butter out of the jar.